With Samsung leaks picking up the pace alongside the Consumer Electronics Show in Las Vegas, there’s no reason to forget China’s rising smartphone manufacturer Xiaomi. Xiaomi made the headlines last year with the launch of its Xiaomi Mi 4, a device that was elegantly designed despite being modestly priced. Well looks like the Chinese manufacturer already has a successor for the Mi 4 in the works, with a poster allegedly showing the next Xiaomi flagship, the Xiaomi Mi4S having popped up today. We’ve already shown you a previous alleged spotting of the Mi4S and today’s device ends up looking quite similar to the one shown earlier. 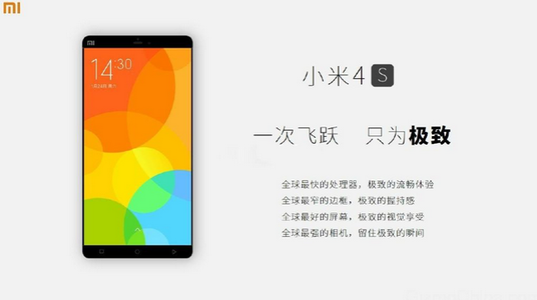 Alleged Xiaomi Mi4S Poster Shows Remarkable Device With Thin Bezels. Looks like Xiaomi’s Mi4S has made another appearance online, this time in the form of a poster detailing the device. While our Chinese isn’t that good, so we wont be able to tell you what the poster above says, but we can definitely take a look at what appears to be another elegantly designed device from the Chinese manufacturer. Looks like Xiaomi has gotten a feature that most manufacturers are struggling with, right on its next device. As you can see above, the device comes with remarkably thin bezels which end up lending it a more futuristic look. If the image above is accurate, then Xiaomi might have a winner on its hand. The company is expected to unveil its next flagship sometime this month so pretty soon we’ll be able to know for sure what the Xiaomi Mi4S looks like. The device is also expected to come with Qualcomm’s Snapdragon 810 on board coupled with 3 GB of RAM and a 20.7 MP rear camera. All of these specifications, if true will end up putting the Mi4S alongside the top flagships of this year. So stay tuned. We’ll keep you updated as things develop and in the meanwhile, let us know what you think in the comments section.